We all know that to be “healthy” we have to eat our fruits and vegetables, drink lots of water, exercise regularly, and sleep deeply. If we do these things, we’ll probably feel pretty good most of the time. But what a lot of us don’t know is that it’s possible to feel more than pretty good. It’s actually possible to feel great, a lot of the time, and what’s crazy is that so many of us don’t even know what that might feel like. We’ve gotten used to feeling pretty good. As a holistic nutritionist-in-training, one of the epiphanies I keep having over and over again is that we’ve given up on optimal health. We’ve decided that feeling fatigued, sleeping restlessly, having digestive problems, experiencing debilitating PMS, and more is normal. These things might be common, but they don’t have to be normal. There’s so much more contributing to your health than vegetables and water, and when you start to nurture these other areas – like relationships, time in nature, a diet rich in local and seasonal foods – and when you start experimenting with possible ways to lend your body a hand – like with supplements, different food preparation techniques, and cleansing – you might notice that you feel better than you thought you could. Cleansing is the practice that scared me the most. I eat a lot. My days are long, typically keeping me on the go from about 6am to 10pm, and I work out for work, teaching 10-12 spin and barre classes a week. Those two factors combined mean that my calorie consumption is probably much higher than it is for other women my age and size (although I’ve never counted a calorie and couldn’t begin to guess how many I consume and burn in a day, sorry not sorry). I also love food. I see it as fuel, I see it as medicine, but I also see it as the most fun and creative part of my day. I like to cook, I like to eat, and I did not like the idea of not doing those things for a few days. In school I learned that one of the major health practices missing from Western culture is fasting, or cleansing. Plenty of ancient traditions and Eastern cultures have fasting built into their customs and rituals. And guess what? They have much healthier digestive systems than we do. (There are other contributing factors, of course. For example, fermented foods are missing as a staple in most Western diets. And we eat a lot more sugar and refined carbohydrates.) Digestion is the bodily process that takes up the most energy. If your digestion is sluggish, it could not only be stopping you from absorbing necessary nutrients, but could be contributing to that overall feeling of fatigue that seems to plague so many of us. We abuse our digestive systems, pouring in tons of processed foods, alcohol, dairy, and other foods that are tough to break down, but, what’s almost worse is that we never give our digestive systems a break. While it’s still working on the ice cream from last night, we’re up again and giving it some coffee to contend with. I knew all of this, but I was still resistant to try a cleanse myself, because I didn’t want to feel hungry. I couldn’t imagine having only water or juice for several days in a row. Then, a local smoothie company called Blended For You approached me and asked if I would try one of their smoothie cleanses. This sounded like the perfect fit for me: I could give my body the break from food that it needed, but still get all the vitamins and nutrients I craved for fuel, and enjoy different blends of flavours and ingredients throughout the day. I tried the Trainer Cleanse, which consists of five smoothies a day for three days. I loved that each smoothie was so different, and that I was given an order in which to enjoy them – it took out the guesswork and made me feel supported along the way. 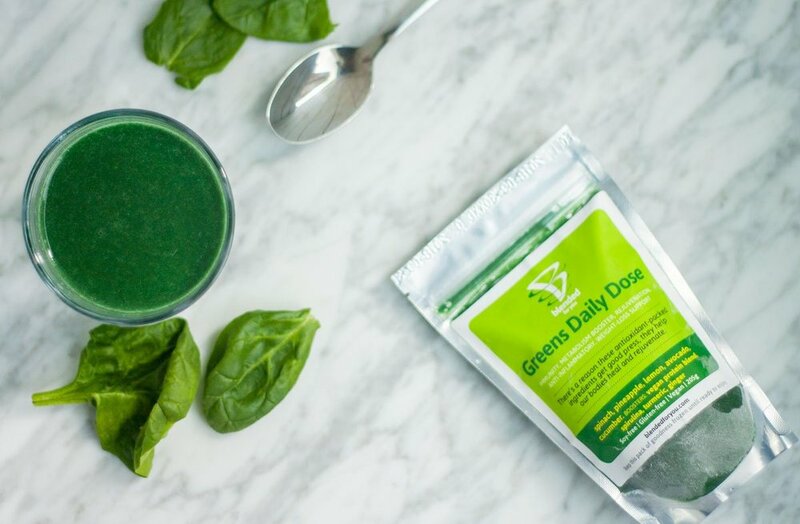 I started my day with the Greens Daily Dose, had the Greens Detox, The Athlete, and The Remedy on-the-go throughout the day, and ended my day with the Blueberry Boost. Each one was packed with a hearty base of fruits, vegetables, and healthy fats like coconut oil or almond butter, and had different therapeutic boosters such as dandelion root, spirulina, turmeric, and more. The smoothies come to you packaged and frozen. I would simply move tomorrow’s smoothies from the freezer to the fridge, and when I was ready to enjoy, I would add the smoothie to a mason jar with either coconut water or just filtered tap water, shake it up, and drink. It was quick and easy, and delicious. My favourite smoothie was definitely the Greens Detox. It’s a spicy smoothie made with spinach, kale, lemon, avocado, cucumber, cayenne, vegan protein blend, turmeric, ginger, dandelion root, and chlorophyll. Wow! That’s a good pre-work out smoothie. I hadn’t felt that energized in a long time. What I love about Blended For You, aside from the fact that they’re a local company making health more accessible, is that they really aim to use the smoothie cleanse to set you up for success moving forward. This cleanse is not about taking a break from bad habits so that you can return to bad habits with more vigour; rather, it’s a launching pad for clean eating, a stepping stone towards that state of optimal health the we were talking about. They provide an awesome ingredient guide that gives you plenty of ideas for how to structure your diet after the cleanse so that you can continue to feel great. So, how did I feel on the cleanse? I felt good! Mornings were the best part. I had more time, I had a kick of fresh vitamins, and I felt motivated by my healthy choices. I also probably taught some of the best classes I have in a long while, because I felt lighter, more focused, and more energized. By dinner time, I was hungry. I ended up steaming some broccoli and carrots for a small meal, just to get the sense of my stomach feeling full. But in terms of energy levels, strength and endurance, mental focus, and mood – I was feeling better than usual. The key, as always, is to listen to your body. That sounds a lot easier than it really is. It takes time to build that connection that allows you to really hear what your body needs. If you haven’t yet gotten the message that you need to cleanse, then don’t do it. But if you’re starting to sense that your system needs a bit of a break, I highly recommend the Blended For You smoothie cleanse as a safe and approachable option. And again, when cleansing, be flexible. Listen. A cleanse is not about starving your body (at all! ), it’s about supporting your body. Cleanses don’t seem so scary to me anymore, but I do think I’ll stick to a Blended For You smoothie cleanse next time my digestive system needs a break, rather than diving into a water cleanse (not for me!). Since my cleanse, I’ve been turning to their smoothies to supplement my diet. I love the Greens Detox whenever I need an energy boost midday, and the Maca Energy is a great coffee replacement in the morning. Blended For You doesn’t only offer cleanse packages; you can handpick your own selection of favourites, and sprinkle them into your diet, which is a great option if you feel like you need a boost of nutrients. And guess what? All Cadence riders get a discount on their first purchase from Blended For You! Use code CADENCEVAN$15 upon purchase to get $15 off your first order, valid until March 31. If you have any questions about the smoothies, or about cleanses or nutrition in general, feel free to reach out by leaving a comment below or finding me in the studio.